Android and the HTC EVO 3D are capable of handling all sorts of messaging – SMS, MMS, email. Social networking is backed-up by several apps and widgets, and there’s Gtalk, which can connect you to Google’s chat network and compatible networks too (like Ovi Chat). The notification area will display a line of an incoming SMS or just the number of messages if there’s more than one. You can set the status LED to alert of unread messages too. Text and multimedia messages are displayed in threads – you see a list of all conversations, each one is listed with the contact’s photo, name and the subject of the last message, as well as a part of the actual message. Tapping a conversation brings up the entire message history with that contact. The whole thing looks almost the same as a chat client. When viewing a thread, the most recent message is placed at the bottom. To add recipients, just start typing a name or number and choose from the contacts offered – the phone will find the contact you want even if you misspell it (e.g. “drx” matches Dexter). The compose text box is bigger and covers nearly half of the screen in landscape mode. A tap-and-hold on the text box gives you access to functions such as cut, copy and paste. You are free to paste the copied text across applications like email, notes, chats, etc. and vice versa. Gingerbread text selection is very user friendly. Upon a press and hold, a “magnifying glass” appears, enabling accurate cursor movements. A custom-made virtual QWERTY keyboard is the only means of text input on the EVO 3D. While it’s not as good as a hardware one, it does the job. the 4.3” screen has enough real estate for big, well-spaced keys, which are easy to hit. The HTC EVO 3D comes with two email apps – the traditional Gmail app and the generic HTC Mail app, which brings all your email accounts together into a single inbox. The Gmail app has the trademark conversation style view and can manage multiple (Gmail) accounts. Batch operations are supported too, in case you need to handle email messages in bulk. The standard HTC Mail app features several tabs that let you filter the inbox: you can opt to display conversations, emails with attachments only, unread mail only or invitations. You can mark emails too – they will show up in the marked mail tab. The conversation view tries to mimic the original Gmail client threaded view, which is otherwise missing in the generic inbox. The HTC email app can handle several accounts and not just from Gmail. When you add multiple accounts, you can view each inbox individually or go into the All accounts section. Each account is color coded, so you can quickly associate each message with its relevant account. There's hardly anything the HTC EVO 3D lacks in terms of email capabilities. The settings for popular email services are automatically configured. POP/IMAP accounts and Active Sync accounts are supported. The image gallery on the EVO 3D is one of the places where 3D content is displayed – it’s the stereoscopic images you’ve taken with the device. What we missed was a dedicated 3D media app like the 3D Space on LG’s Optimus 3D. The HTC gallery has changed - it now stacks photos like the vanilla Android gallery does (it used to display a list of thumbnails). The Albums app automatically locates images and videos, no matter where they are stored. Images taken in 3D have a small 3D tag to be easily identified. Images and videos stored in different folders appear in different sub-galleries that automatically get the name of the folder – which is an effective file management solution. You can also select which folders the gallery should display. Ones you pick one of the "stacks" (each representing a folder), you're presented with a grid of the photos inside. There is also a camera shortcut, but it’s only available once you start browsing any of the sub-folders. Sharing a photo on the HTC EVO 3D is very straightforward – tap the share button and pick your preferred sharing method. There’s everything from sharing via Bluetooth or email, to posting on Facebook, Twitter or photo sharing sites like Picasa and Flickr. You can also upload videos straight to YouTube. You could use DLNA to push photos to your compatible TV too. You can also mass delete images, but still no mass copy-and-paste options. You can’t copy/paste images from folder to folder either – you’d need a proper file manager for that. 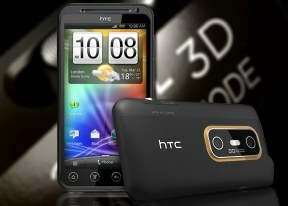 HTC EVO 3D supports multi-touch and you can take full advantage of it while browsing your images. You can zoom to 100% with a simple double tap on the screen. The implementation here is extra smooth too. 3D imaging is not everyone’s cup of tea – it’s uncomfortable to some, especially on such a small screen. If you zoom in on a 3D photo it will automatically switch to 2D mode. There’s not much point though as those images are 2 MP only and their quality is poor.